of emerging interest to the Congress in the future. urban development, and., sources, of. energy. gressional committees and Members' offices. 317 explains how this is'done. processed by the automated system. system can be gained by consulting an In-Process List. produces follow-ups to be mailed to the vendor. has not succeeded in doing so. available from the Korean Unit, Orientalia Division. With the recent deaths of Dr. and Mrs. Werner B.
was found dead in her apartment on July 3.
devoted most of her life. of College and Research Libraries in 1960-64. Yugoslavia. In 1957-62, she was a member of the U.S.
New Jersey Imprints, 1784-1800 (1939). Miss Morsch was married in 1944 to Werner B.
Washington University Hospital in Washington, D.C.
law of individual jurisdictions. From 1958 on, Dr.
published in 1963 and later in enlarged form in 1969.
wish that there be no memorial services. define "Government" publications for this purpose. government publications. The term "government"
university press, or could be more narrowly defined. Operators Guy Ross, Samuel Houser, and Lonnie Taylor. the machine and pack it down until level with the floor. of paper onto the top plate of the machine. With the doors open on opposite sides of the machine, Mr.
tain loose paper; wire bands are then placed around the bail. recycling paper company will take delivery. cups and similar waste are not collected for bailing. costs more than regular paper. bined length of service of carpool membership. mit holders on a first-come first -served basis only. maximum utilization of the limited space. articles on New England folk songs. additional materials on the 1940's. Saigon on her return home. science at Syracuse University, came to LC June 26.
observe recent Library of Congress developments. University of Ibadan, lbadan, Nigeria. student in the Graduate School of Library Service. librarian at Makerere University. Kampala. Mrs. Rose Toeg, librarian for the USIA in Tel Aviv. Mrs. Nira Naveh, Head of the Archaeology Library. Chung, spent the week of June 13-20 in Washington. Studies in Stockholm, Sweden, Britt Johansson. and paid visits to the Latin American. Portuguese. various divisions of the Processing Department. can material before returning to Sweden. Section of the Copyright Office Cataloging Division. She is survived by her husband. Silvio F. Baldassare. lives in the Distnct of Columbia. additional names will be noted next week. and Reader Division, then known as Reading Rooms. at the time of retirement. Section in the Copyright Oftice Reference Division. given by 40 of her colleagues on June 15.
after more than 27 years of Federal service. Library Assistant in the Register's Office. Mrs. Hilah J. Gaba, Samuel Bryant, and Calvin L.
tions to the Library of Congress. these duties in addition to her regular duties, Mrs.
and the Library of Congress." in savings for the Cold Regions Bibliography Project. Engineers held in Cambridge, Mass., on June 22-25.
during the first three weeks of June. ceremonies held on June 9. Story on pp. 319-20. Rodgers were presented with originality. Elihabeth Giflord, Personnel Operations Office: Mrs.
Glad," spirits ran high with Sammy VH.ishingtn. ing Division: and Linda Umalas. sion. Mr. Mumford. tion were: musical arrangements. Information Systems Office; accompanists. Mr.
typists, Mrs. Barbara Collins and Maxine Christian. Card Division; scenery. Mrs. Connolly and Mr.
and president and business manager. Miss Nickerson. plexions and who are exposed excessively to sunlight. his duties on a full time basis the first of July. was named to the Coordinator post. liminary cataloger, GS-5, Desc Cat, 2671; Siti Aisah Prajogo. descriptive cataloger, GS-11, Desc Cat, NP; Michael H.
Strohmeyer, music cataloger, GS-9, Desc Cat, 2830.
tor, GS-13, CRS D, 2858. Promotions: Earl O. Carter, to deck attendent, GS-3, S&R. Publ, to shelflister-trainee, GS-5, Subj Cat, 2820; Joyce B.
Morgan, Subj Cat, to assistant editor of catalog publications. to fiscal accountant assistant, GS-7, FMO, 2931; Eileen G.
2744; Elizabeth B. Zach, CRS L, to reference specialist. CRS E; Donald J. Wilson, Bldgs Mgmt. Assistant in the Loan Division. Arlington Hospital, and weighed 7 lbs., and 1 oz. Mr.
cals: Title Index. January-June 1969. (pp. and $62.50 a year, foreign. Digest of Public General Bills and Resolutions. 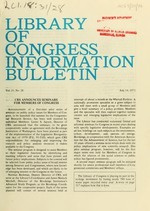 Information for Readers in the Library of Congress. Loomis manuscripts opens at Library of Congress. on November 29 and Atlanta on March 7, 1973.
record to NCLIS, 1717 K St., N.W., Washington, D.C.
part of the official hearing record. bringing the new body into being. will be to decide on a location for headquarters. bibliographies, and statistics for the past fiscal year. "Mechanization of Library Technical Processes,"
August 11-12; "Cost Analysis of Library Operations,"
restorers and conservators, will lead the sessions. Binding Methods as Related to Book Restoration,"
and "Survey of Binding Styles and Techniques." Bindery, Drawer L, Sedona, Ariz. 86336.